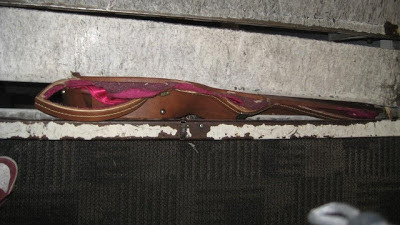 Stories of airlines damaging travelers’ baggage are about as common as delayed flights these days, but a particularly dreadful mishap occurred recently. Dave Schneider, the lead guitarist of a Jewish band called the Leevees (with Guster’s Adam Gardner) that produces only Hanukkah-themed songs, was traveling on a flight from Buffalo to Detroit. The Delta flight went fine without any problems, but it was after landing at Detroit Metropolitan Airport that the nightmare began. Schneider, who also is the lead singer of the Zambonis, a band that only play songs about hockey, was told by Delta Airlines that he would have to check his vintage 1963 Gibson ES-335 TD guitar rather than carrying it on the flight with him. He even offered to purchase a seat on the plane for the guitar, but Delta refused. Upon landing in Detroit Schneider shot video footage from his cellphone of the baggage handlers moving his guitar off the plane, but there was no damage then. It was only later that he was informed that his cherished guitar was crushed between a service elevator and a loading dock at the gate in Detroit. Delta authorities quickly offered Schneider $1,000 for his vintage guitar, which was likely worth close to $10,000. Of course he declined Delta’s offer as inadequate. Even to repair the classic guitar would have cost more than Delta’s measly offering. This isn’t the first time an airline has damaged a musician’s vintage guitar. A few years ago United Airlines broke Dave Carroll’s Taylor Guitar. Carroll famously wrote a song attacking United Airlines, which became a YouTube hit, and then subsequently penned a book about the power of social media and customer service. Schneider didn’t write any songs about Delta, but he did fill out the claim forms for damaged property after declining that $1,000 check from Delta. He never received a response. His two emails to Delta chief executive Richard Anderson were never answered. Schneider, under the pseudonym Dave Leevee, used that vintage guitar to play such Jewish holiday classics as “Latke Clan,” “How Do You Spell Channukkahh?” and “Goyim Friends.” Without the guitar, Schneider lost his mojo. And that’s when Gibson, the global musical and lifestyle-oriented company based in Nashville stepped forward to present the musician who sings about Hanukkah with a belated Hanukkah present. Schneider picked up his replacement guitar in New York last week from Gibson CEO and technology visionary Henry Juszkiewicz. “At Gibson we’re committed to music and those who love and appreciate their instruments,” Juszkiewicz said. “For musicians like Dave, instruments are practically members of their family. It was only right to replace his guitar." Schneider will be able to continue playing guitar and singing about Hanukkah and hockey thanks to Gibson’s generous gift. Where Delta left Schneider kvetching, Gibson left him kvelling. As far as air travel goes, it’s questionable if Dave Schneider will ever fly Delta again. If he does, you can bet he’ll likely send his guitar ahead of time on a different airline. Wow, a happy ending, but still one of my worst nightmares! Note to self, avoid Delta!